Her ‘old man’ may really be an All Black but high flying young professional, Hannah Cameron, is committed to charting her own course in life. Those who dream big may well benefit from having their heads in the clouds. 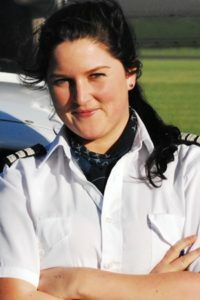 Ironically, Hannah’s day job (as a flying instructor for CTC Aviation), has required she remain well and truly grounded. “Flying is probably [safer than driving a bus]… there’s less stuff to hit!” she laughs. “For 99% of the time it’s pretty unexciting. That’s why we need to train so hard and stay focused, to make ensure we’re well prepared in case something goes wrong. The young Hamiltonian has her sights fixed on the next step (or giant leap) in her career. “Probably within the next five years I’d like to be with an airline and, later on, flying long haul with international, wide-bodied jets. I’m working towards my ATPL (Air Transport Pilot Licence). 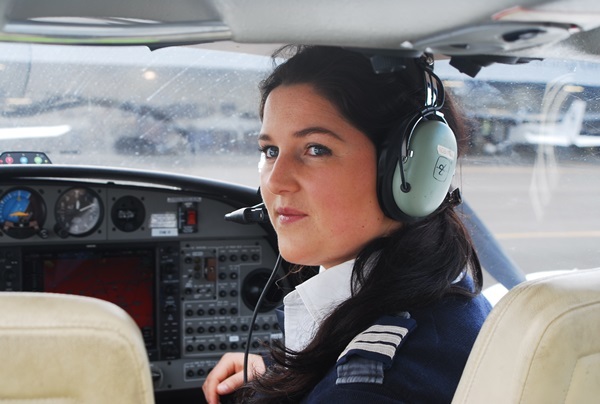 I don’t need this now, but I will, if I get an airline job, to become a captain,” she explains. However, she adds that, in an industry where approximately four percent of international pilots are women, she will need to work hard to reach the top. Hannah believes gender parity in the aviation sector ultimately requires young women to realise that opportunities are there for the taking. “There have been some exceptionally talented female pilots – Jean Batten, for one, and Amelia Earhart. So those of us within the industry need to demonstrate that this really is an achievable career. While Hannah may now have made Hamilton her home, as daughter to a dairy farmer (former All Black, Lachie Cameron) rural blood runs deep. Whenever her ‘day job’ allows, she devotes much of her time to NZ Young Farmers, serving as the organisation’s Waikato/Bay of Plenty Regional Chairperson. While women have long played an essential role in farming families, New Zealand’s primary industries can benefit from more than just a little ‘women’s work,’ she believes. “The phrase ‘just a farmer’s wife’ needs to be reassessed for a start. There are some pretty amazing women doing some pretty amazing things and a lot of seriously strategic brains among women involved throughout the primary industries. It would be a serious disservice if this resource were to continue to be underutilised and underdeveloped,” she says. Hannah is currently the only woman to hold a regional chair position with Young Farmers but says the organisation is undertaking a concerted effort to ensure more women take their place alongside men at the highest levels. She says working with Young Farmers has allowed her to put her studies (in outdoor education and business) to good use, while drawing on her rural upbringing. Along these lines, it’s fair to say strong rural roots have helped Hannah blossom. So much so that driven 27-year-old became one of the first recipients of the inaugural NZ Young Farmers Excellence Award late last year. “I didn’t even realise I’d been nominated; I didn’t have a clue until I found out I’d won!” she exclaims. “Considering we have so many fantastic people doing great things within the organisation and beyond, it really is an honour,” she says.